The all-new Nissan March is certainly quite a looker on its own, but that hasn’t stopped the carmaker from making the B-segment hatch even more appealing. Making its debut at the Geneva Motor Show is the Micra Bose Personal Edition (the March is known as the Micra in Europe). Only 3,000 units of the special edition model will be offered, and all will be based on the range-topping Tekna trim level. As the name suggests, the car boasts some pretty nifty Bose hardware, as a way to celebrate Nissan’s collaboration with the audio equipment company. Inside, you’ll find a Bose Personal six-speaker sound system, which actually comes standard on the Tekna trim. It features twin Bose UltraNearfield speakers built into the driver’s seat head rest. This setup allows for a more immersive listening experience, which can be tailored to suit the driver’s tastes via the Bose PersonalSpace Control feature in the car’s infotainment settings. 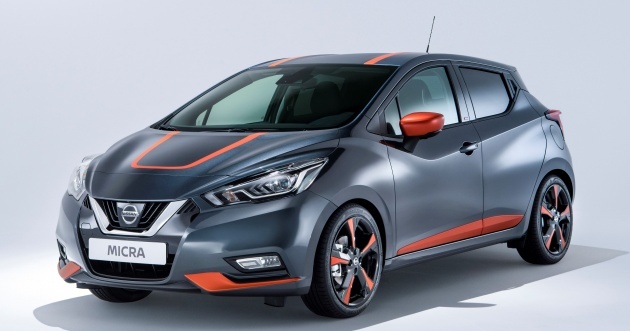 To distinguish itself from a regular March, the car comes with Energy Orange accents on the exterior, which can be finished in one of two colours – Enigma Black or Gunmetal Grey. These details can be seen on the bumpers, doors, side mirrors, and 17-inch alloy wheels. Customers will get to order the Micra Bose Personal Edition with either a 90 PS 0.9 litre turbo three-cylinder petrol engine or a 90PS 1.5 litre 90 PS turbodiesel. Standard equipment includes LED headlights, Nissan Intelligent Key, the Safety Pack and heated front seats.